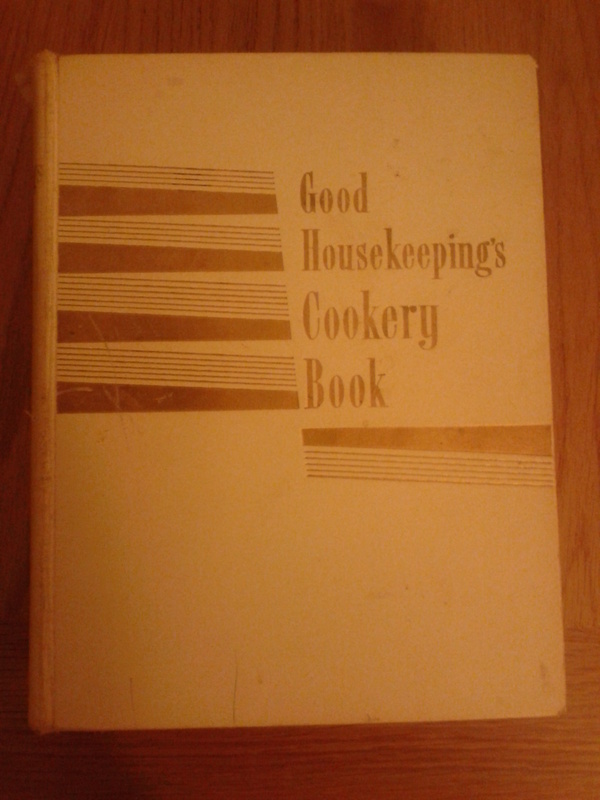 The volume itself is very handsome with several recipes that I recognise from my own mid-century Good Housekeeping tome, as well as some full colour adverts. And here’s the actual recipe (tenously related: I only like walnuts in salad or Balkan pesto, otherwise they just annoy me). The recipe doesn’t specify the number of people it is supposed to feed, however the eight of us made short work of it. Because the mayonnaise was a very mild variety, the ingredients didn’t create fireworks, so much as sensibly mingle, like colleagues in a pub. A grassy olive oil and more seasoning (mustard or tarragon) in the mayo would have been a very different proposition. The rest of the meal progressed in a more conventionally satisfying fashion: two curries – lamb and vegetable, yoghurt and rice, followed by a classic German chocolate cake made with ground almonds. I’m not sure I can recommend that you try this, as I’m too much of a fan of plain yoghurt as a salad dressing when I want something rich. If you like mayo, go for it, but then if you like mayo, you probably already dip all sorts of things in it. I give huge props to L, for opening the book at random and making the thing which made her laugh the most. 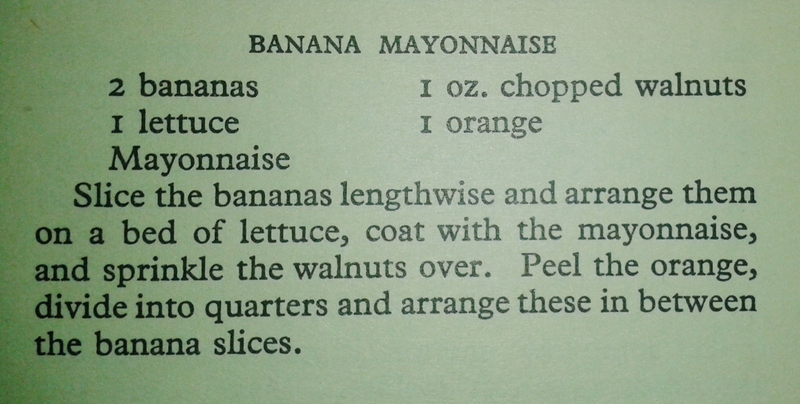 This entry was posted in 1950s, Good Housekeeping and tagged banana, lettuce, mayonnaise, orange, walnuts. Bookmark the permalink. I don’t recall seeing mayonnaise in the 50s, salad cream was al lwe had, failing that, vinegar on lettuce and tomato was a kind of dressing. Olive oil was got at a chemist shop since it was used as a medicine, mostly for warming up and putting into sore ears. It came in tiny phials. Banana in salad isn’t unusual in his house, though it tends to be added to a random mix of leaves and whatever’s in the salad drawer, rather than a starring role. 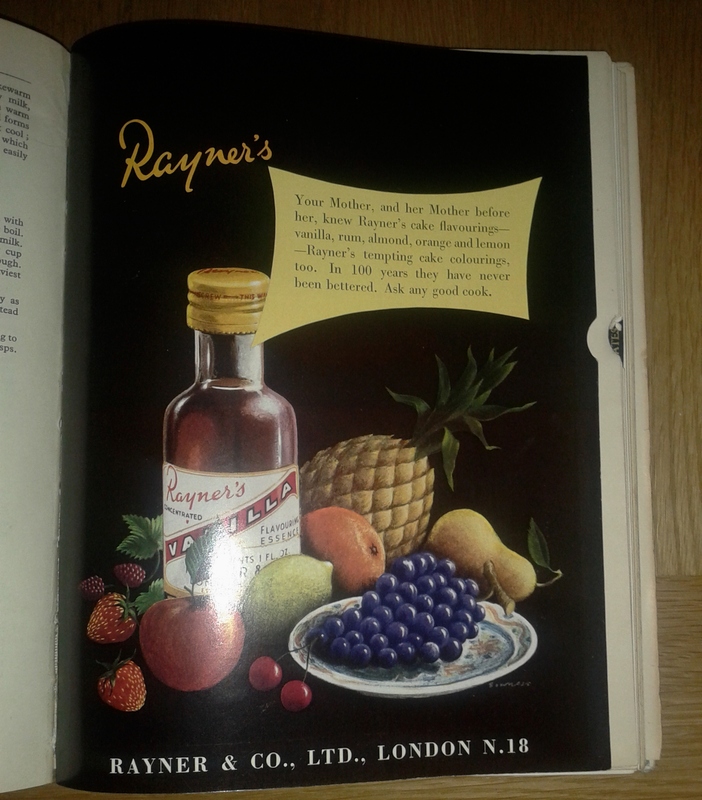 In the 1950’s it was probably very innovative, and American, to serve fruit thus. PS – It should be ‘this house’ (above). 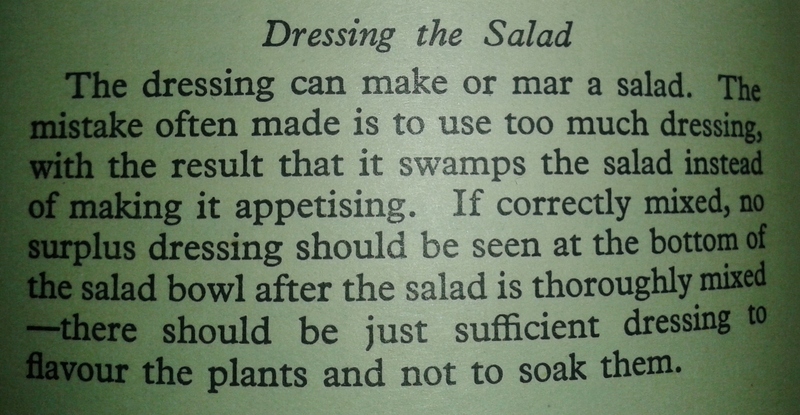 Also, I have a Penguin Salad Book first published in USA 1962 (UK 1969) which has banana in about 5 recipes plus a dressing. Mayonnaise with fruit is a revolting combination. How it got to become so ubiquitous in the USA – reaching its height of popularity during the 1920s, I believe – mystifies me completely. I cannot truly cannot understand how people can eat it. 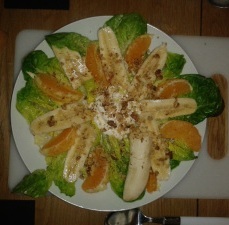 Any salad with a fruit component should only be served with a cream dressing: viz. proper double cream, with lemon juice and light seasoning, not one of those ‘cooked dressing’ horrors or anything involving cornflour or evaporated milk. Now Evap alone is a fine topping for canned fruit but whoever decided to make salad dressings out of it needs to make public restitution.